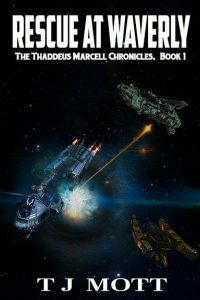 The Thaddeus Marcell Chronicles is a six-novel science fiction series by author TJ Mott. The known galaxy is dominated by a large, ancient, decaying confederation called the Norma Empire. Beyond its borders lies the galactic frontiers: a myriad of smaller empires, tiny two-or-three star system sectors, and millions of cubic light-years of empty, unpopulated space. One such frontier region, lying beyond the borders to the galactic south of the Empire’s most highly-populated sectors, is a vast, sparsely-populated area known as the Independent Regions. 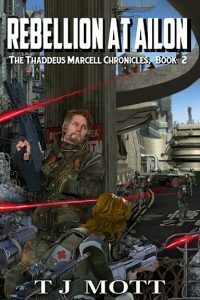 A number of small civilizations and empires call this their home, yet one shadowy mercenary Organization quietly dominates the region from its secret base on a rogue, deep-space asteroid. This Organization, full of mercenaries, pirates, and spies, belongs to one Thad Marcell. He’s an escaped slave who transformed the group into a major intelligence-gathering firm with some formidable fleets-for-hire under his command. But his real goal is to locate his missing homeworld, a planet he’d been abducted from many years ago before being sold into slavery. A planet that exists on none of the galactic charts, and only persists through vague rumors and legends, long believed to be nothing more than a myth. Click on an image below for more information about each book.